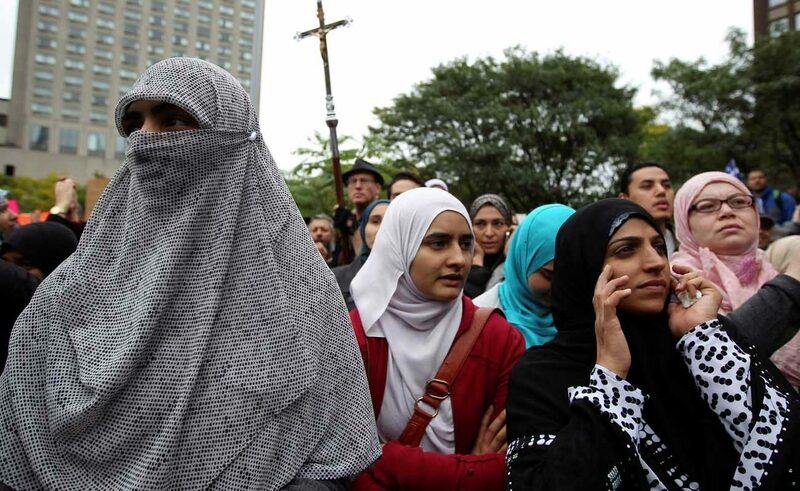 QUEBEC CITY (CNS) — The new Quebec law on state neutrality on religion is under fire, as many deem it “discriminatory” against some Muslim women. Bill 62, officially “Act to foster adherence to state religious neutrality and, in particular, to provide a framework for requests for accommodations on religious grounds in certain bodies,” was adopted Oct. 18. This legislative text requires that, from now on, all public services be given and received without anything covering a person’s face. First presented at the Quebec National Assembly in June 2015, the draft was amended in August to also include all employees in Quebec municipalities, not just Quebec government employees, as it was first intended. Though there is no mention of any specific prohibited face-covering in the new law, it indirectly concerns Muslim women who wear a hijab or a burqa. On Oct. 24, she published guidelines on how to apply the new law. She stressed that Bill 62 only applies when there is an interaction between a public service provider and a receiver. For Quebec Premier Philippe Couillard, seeing each other’s face for public services is a matter of security, identification and communication. However, the law was quickly criticized when it became clear that it means that some Muslim women might not be allowed into public transports, such as buses or subways, where they might need to interact with public service providers. Montreal Mayor Denis Coderre called the new provisions “unacceptable.” Both the city of Montreal and the Quebec Union of Municipalities announced they would not apply them. The Canadian Muslim Forum reacted by denouncing the “the discriminatory and marginalizing nature” of Article 9 of Bill 62, which requires one’s face to be uncovered when giving or receiving public services. The Canadian Council of Muslim Women said the law lacked “coherence” by tagging a religious minority. “If we want to encourage Muslim women to blend in, we must encourage them to go out. By refusing to let her take the bus, you’re marginalizing her, reducing her choices,” said spokeswoman Samaa Elibyari. “If it walks like racist and talks like racist, is Quebec really not? It’s certainly anti-religious,” wrote Anglican Bishop Mary Irwin-Gibson of Montreal, before deleting her post. The comment was not well received by many French-speaking Quebecers, including the Rev. Richard Bonetto of St. Luke’s Presbyterian Church in Montreal, who said he opposes the law’s provisions. The Canadian Conference of Catholic Bishops said it will not comment on a provincial matter. There are no reactions so far from the Catholic church in Quebec. Last year, the Assembly of Catholic Bishops of Quebec presented its views on religious plurality and religious liberty during consultations around the draft. The current debate is reminiscent of the ongoing 10-year debate in Quebec about reasonable accommodations for religious demands. After a series of such demands sparked outrage, the Quebec government mandated philosopher Charles Taylor and sociologist Gerard Bouchard analyze the matter. One of their recommendations was that the Quebec provincial government prohibit religious symbols for any person representing state authority, such as judges and police officers. In 2010, a first draft very similar to the October bill was introduced by the Liberals, but it never went through. In 2013, the Parti Quebecois introduced its “Quebec Charter of Values” that would have also imposed religious neutrality to all state personnel, including in education and health care. The draft died when the Liberals won the elections in 2014. They introduced their take on the reasonable accommodations issue in 2015. It was this draft that passed in October. The law was passed after January’s Quebec mosque shooting that killed six Muslims, and after some demonstrations against immigrants in different Quebec regions these past months. On Oct. 4, an Angus Reid poll revealed that 87 percent of Quebecers approved of Bill 62. Canadian Prime Minister Justin Trudeau said the federal government would look at the new provincial law to see if it would contest it.